10m Multi Coloured LED Ropelight. Out of stock and now discontinued!! 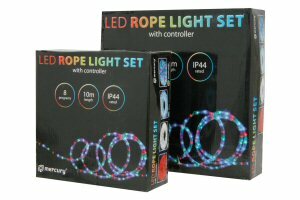 These outdoor IP44 rated LED rope light sets have 8 pre-programmed sequences, allowing you to adjust the mode to your preference via the supplied in-line controller. Using the latest LED technology, these rope lights will use 90% less energy, yet produce the same level of brightness as a traditional rice bulb. The high quality LEDs have a long lifespan (around 100,000 hours) and are energy efficient making them ideal for decorating homes, shops etc.